I know at least one of my readers is groaning right about now. It seems Jane Austen is mentioned on this blog every couple of months. I cant really help it, Austen's world is like my favorite comfort read/ watch/ food all rolled up into one. Last month I found myself trolling Netflix for something light to watch when the mini-series 'Lost in Austen' (LiA) popped up in my queue. It was perfect, over 3 hours long I watched it over a period of two weeks, sometimes as little as 10 minutes when I had time to spare. Being familiar with the story did help with not losing continuity but this version does have enough originality to keep the Austen fan involved and satisfied. Amanda Price (Jemima Rooper), of Hammersmith, London, spends far too much time with her copy of Pride & Prejudice as an escape from her dull job and unromantic boyfriend. Her idea of a perfect night is at home, pouring herself a glass of wine, curling up in her jammies with Darcy's voice and Austen's language running through her head. Her best friend and mom think she's too involved with Darcy, her mom even accusing her of holding all the men she knows to impossible standards. But, as Amanda explains, she just loves Austen's England so much, the manners, the gentility, the courtship. So, she thinks she's hallucinating when one evening, as she's engaged in her favorite pastime, hearing an intruder in the bathroom, she investigates to find .... Elizabeth Bennett (Gemma Arterton)! Apparently, Amanda has opened some sort of portal between 21st century England and the Regency period. And the next time Lizzy turns up, it's to push Amanda through the portal, into the attic in Longbourne. The idea being that Lizzy is visiting Amanda's folks in Hammersmith for an extended period while Amanda takes her place in the bosom of the Bennet family. Unfortunately, for Miss Price, things arent quite so smooth-sailing after that. The Bennet family, accepts the strangely dressed girl given over to obscure statements 'Jane will marry Bingley, Lizzy will marry Darcy', with, if not enthusiasm, then fondness for Lizzy's sake. She soon finds that all her well-intentioned meddling is leading to unforeseen consequences and when a disastrous event occurs (Lady Catherine decides to foist a trio of even more objectionable Collins' brothers on the unmarried Bennets for one, and others which I will not spoil) she ceases actively arranging things and decides to just go along for the ride. And funnily enough, things straighten themselves out, if not as Austen intended, then with a guaranteed happy ending for our heroine. I'm one of those guilty of holding Austen adaptations to high standards. But, in reality, it's not the adaptations that I find outrageous, it's when someone takes liberties with the original itself (*cough* Keira Knightley's P&P). I thought LiA is well-worth the watch for a fantasy adaptation. It is a very romanticized version, not as real as Austen's world, but with that sheen of happy-endings-for-everyone (even poor forgotten Caroline Bingley) that makes up frothy mind-candy. I liked it for that. And all the actors did a great job. The mini-series is also going to be adapted into a movie by 2011. If I had to find fault with it, I think it's that the film-makers do not push the envelope too much. When Amanda finds herself in the Bennet household, she's dressed in jeans, boots and a leather jacket with her hair untied and in bangs. No one does so much as raise an eyebrow at the unconventional attire or hair style. Amanda is similarly very ill-prepared for spending time in Regency England for someone who has read about it for so long, she continually finds things surprising or doesn't understand how society behaves. And it seems so weird for the Bennet family to accept that Lizzy has traveled alone to an unknown location or leaving all her clothes behind. Or to accept a stranger with no luggage of her own. Ahh, quibbles!! The best part of this adaptation, and one which in Amanda's words would have Ms. Austen spinning in her grave is Wickham (Tom Riley). The charmer everyone loves to hate has a great character arc here. In fact, I would have been much happier with this version if they had done away with Austen's original hero and come up with another in his place. Now, I'm not certain if this desire to subvert the original isn't because I hated Darcy's character here (except in the scene mentioned below) and didnt think he was believable and thought Wickham was gorgeous (ladies, cast your eyes to the left), but, I'm sure that the film-makers were not looking to be too radical, they just wanted soft-focus romance which LiA does provide. In closing, I have to mention LiA's nod to the original wet shirt scene. Made all the more sweet because LiA's Darcy doesnt know what it is Amanda's after, he agrees to dunk himself in cold water because he wants to please her. Awwwww!! 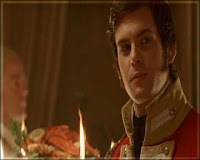 Of course, as hunky as Mr. Cowan is, no Darcy to my mind has ever compared to the '95 BBC adaptation, so I will leave you with the infamous clip (really, I'm surprised it took so long for Colin Firth to be embedded on this blog) ..... so, enjoy!! This entry was posted on 8:02 PM and is filed under 4/5 , Hollywood , Jane Austen , Mini-Series , Reviews (Movies) . You can follow any responses to this entry through the RSS 2.0 feed. You can leave a response, or trackback from your own site. I'm getting hold of this one for sure. 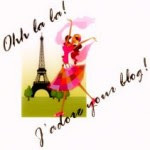 Kals - Welcome to the blog!! And Wickham *sigh* who would have thought??!! Heh!! I'm going to take your suggestion and make sure I watch the movie with a big tub of ice cream to keep me company :) Too bad casting info for the movie isnt available yet!! Bubbles - Do, I'm sure you'll enjoy it!! I can be pretty harsh with JA adaptations too, there was this book called the Jane Austen Club which was written up like anything.. but I didnt enjoy it. Now this sounds like fun.. Tom Riley eh.. and nice to lay my eyes upon a wet darcy once more, though its not in the book. I always had a soft spot for Wickham, he definitely looks dashing in this pic you have of him! Nishita - So you like the bad boys huh? Then definitely read the Roarke books from the beginning!!! I can pretty much watch anything even remotely derived from Austen (though I might not be so kind to it later), so I cannot guarantee you wont be bored ... so you've been warned :) Anyways, let me know what you think if you get your hands on it! And, I hope your little one gets better soon! Of polka dots and fashion donts!